Turf Canada Inc. is always looking for products that are environmentally friendly. We are committed to the IPM Accreditation process of golf clubs and it's superintendents. 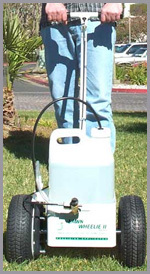 If you are looking for alternative ways to minimize your use or dependence of pesticides, Wheel Spray has designed many models of Motorless Ground-Driven Sprayers which do not require gasoline or batteries for accurate chemical applications of herbicide, fungicide, fertilizer or insecticide. These sprayers will promote a quiet, low profile for all applications and reduce the need for large tank sprayers. For more information, contact us or visit the Wheel Spray web site.